Before the advent of Scalextric and their slot car racing products, the company built friction drive tinplate toys under the label 'Scalex'. 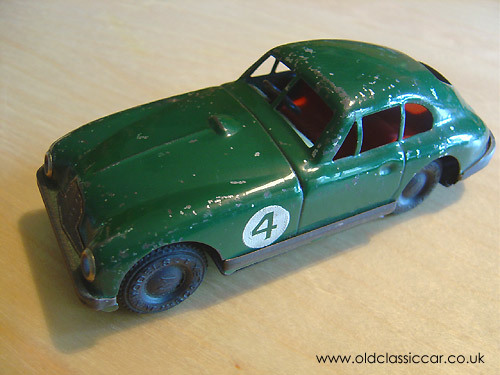 Shown here is one of their toys, the early 1950s Aston Martin DB2. Also available at the time were tin plate GP cars (Maserati, Ferrari etc) and other sports cars, such as Jaguar's XK120. This type of car raced at Le Mans in the early 50s, and this one, with its competition numbers on the front wings, is probably inspired by these famous BRG cars. The tin bases are stamped with information on the manufacturer and the model in question, the original rubber tyres also featuring reference to MiniModels Ltd and Scalex. or the Classic toys main page.